Vaccines have done such a good job of controlling diseases in developed countries, such as the United States, that parents sometimes forget just how important they are and what life would be like without them. Current vaccines and past vaccination programs have now controlled 10 major infectious diseases. Unfortunately, we aren't all living in a post-vaccine era. We are making progress though. The CDC estimates that worldwide, "an estimated 13.8 million deaths were prevented by measles vaccination during 2000–2012" and we are close to eradicating polio. Polio is now endemic in just two countries - Afghanistan and Pakistan. Epidemics of now vaccine-preventable diseases were once very common. In fact, epidemics of measles once occurred in two to five-year cycles in the United States, affecting 200,000 to 500,000 people. Although measles has been mostly eradicated in the United States, some cases are imported are from other parts of the world. That is because measles remains a leading cause of death of young children around the world. Even with low or nonexistent rates of many infections, like measles, polio, and diphtheria in the United States, parents shouldn't forget that these infections are just a plane ride away from your child. That is how the early 2008 California Measles Outbreak got started – an unvaccinated child who traveled to Sweden was exposed to measles, got sick, and got many other kids infected with the measles virus. rates of diphtheria, pertussis, and measles greatly increased after the breakup of the Soviet Union as vaccines became less available in Russia and the other Newly Independent States. In fact, cases of diphtheria reached epidemic levels by 1995 and there were over 4,000 deaths during the outbreak. an outbreak of measles in Ireland in 2000 after routine use of the MMR vaccine fell because of vaccine safety fears, leading to 1407 cases and admission of 111 children to the hospital. Even more concerning, 13 of the children were so sick that they had to be admitted to the intensive care unit, seven were on mechanical ventilators to help them breathe, and three children died. rising rates of measles in Europe, up to 30,000 in 2011, which led to 8 deaths, 27 cases of measles encephalitis, and 1,482 cases of pneumonia. Most cases were in unvaccinated (82%) or incompletely vaccinated (13%) people, after decreased use of the MMR vaccine because of worries over a possible link to autism. polio outbreaks in the Netherlands (1992) and the United States and Canada among the Amish people (1978) -- all among unimmunized people. pertussis outbreaks in Japan (1979) and Sweden (1983) after immunization rates decreased and which led to the deaths of 41 children in Japan that year. a measles outbreak in the Netherlands (1999 to 2000) among a mostly unvaccinated community, which ended with 3,292 cases of measles, 72 hospitalizations, and 3 deaths. a rubella epidemic in 1991 among the Amish in Pennsylvania, who had low immunization rates, led to 95 pregnant women getting rubella, results in 9 miscarriages and 11 cases of congenital rubella syndrome. in Japan in 2013, there were 14,357 cases of rubella and at least 31 cases of congenital rubella syndrome. Diphtheria is a vaccine-preventable illness that is caused by the Corynebacterium diphtheriae bacteria. Symptoms can include a fever, sore throat, and runny nose, and can resemble a common cold. The diphtheria bacteria can produce a toxin that can cause a thick white membrane, which can bleed, to form on an infected person's throat. They can also develop a "bull neck" appearance because the glands in the neck became so enlarged. The infection kind of sounds like strep throat on steroids, and is definitely not something you want your kids to get, especially since some of the complications include myocarditis (inflammation of the heart), airway obstruction, coma, and death. In fact, 5% to 10% of unvaccinated people with diphtheria die. Although there are now few cases of diphtheria in the United States, before routine vaccination with the diphtheria vaccine (the D in the DTaP vaccine), which began in the 1920s, there were more than 125,000 cases and 10,000 deaths each year. People often confuse this bacteria infection with the flu, but it actually has nothing to do with influenza except for the fact that it was first discovered during a flu epidemic. Haemophilus influenzae type b (Hib), before the routine use of the Hib vaccine, was the common cause of bacterial meningitis and was a common cause of bacteremia (a blood infection), pneumonia, and endocarditis (an infection of the valves of the heart). Hib can also cause bacterial infections in other parts of the body, including cellulitis (skin infections), suppurative arthritis (joint infections), and osteomyelitis (bone infections). Epiglottis, another infection that can be caused by the Hib bacteria, is a medical emergency that was feared by doctors and parents, as affected kids needed very quick and expert treatment for a chance to survive. Before routine use of the Hib vaccine in 1988, about 20,000 children had Hib infections each year, including 12,000 cases of bacterial meningitis. Complications of having meningitis could be severe, affecting about 30% of kids, and included deafness, seizures, blindness, and mental retardation. And about 5% of children with bacterial meningitis that was caused by the Hib bacteria died. Measles is an extremely contagious viral infection. Before routine measles immunization began in the United States began in 1963, there were about 4 million cases of measles each year. And unfortunately, about 20% of the children who had measles would have complications, including ear infections (10%), pneumonia (5%), and measles encephalitis (0.1% or 1 in 1,000). Encephalitis is an inflammation of the brain that can lead to seizures, deafness, and brain damage. Most importantly, about 1 to 3 out of every 1,000 cases of measles results in death. Because it is extremely contagious, is still such a problem in many parts of the world, and some parents still worry about the safety of the MMR vaccine and possible links to autism, health experts are on guard for a measles comeback in case immunization rates drop. Mumps is a form of parotitis (inflammation of the parotid gland) that is caused by the paramyxovirus. Complications can include meningitis, encephalitis, orchitis (inflammation of the ovaries or testicles), pancreatitis, and myocarditis. Except for an occasional mumps outbreak, mumps is now rare in the United States. The mumps vaccine was introduced in 1968 and began to be used more routinely in 1977 (it is the middle M in the MMR vaccine). Worldwide, there were still over 400,000 cases of mumps in 2006. Pertussis, or whooping cough, is caused by the Bordetella pertussis bacteria. Although it is now associated with causing an annoying, lingering cough in teens and adults, it is important to remember that pertussis used to be one of the leading causes of death from infections for children. In fact, before routine use of the pertussis vaccine in the 1940s, about 1 out of every 750 children in the United States would die from pertussis each year. Complications of pertussis infections include seizures, pneumonia, apnea, encephalopathy (altered mental status), and up to 1% of infected infants actually die from pertussis. Unlike most of the other vaccine-preventable illnesses, there continue to be about 5,000 to 7,000 cases of pertussis each year in the United States. This is mostly because immunity from childhood pertussis vaccines (the aP in DTaP vaccine) usually wears off after 5 to 10 years, so teens and adults can get pertussis and then pass it on to newborns and infants who haven't completed their pertussis vaccines yet. A recommendation for a booster dose (Tdap) at age 12 should help combat these pertussis infections though. Although people rarely think of polio anymore and some think that it has already been eradicated, there were just over 2,000 cases of polio around the world in 2006. Most cases are now concentrated in just a few countries, including Afghanistan and Pakistan, where it is still endemic. Before the polio vaccine began to be used in 1955, polio outbreaks were common in the United States too though. Polio is caused by a virus and although many children who become infected don't develop any symptoms, about 1 in 200 who are infected develop paralytic polio. Many of these children have a permanent disability and 5 to 10% do not survive. During regular outbreaks in the United States, there were up to about 21,000 cases of paralytic polio each year. Parents feared polio so much that swimming pools and playgrounds used to be closed during summers when there were epidemics. Mass immunization campaigns in the few remaining countries where polio is a problem and continued immunization in all other parts of the world should soon mean that the goal of eradicating polio is a reality. Rubella is also known as German measles or "three-day measles" and unlike most of the other vaccine-preventable infections, this viral disease is usually pretty mild. In fact, many people with rubella don't even have any symptoms. The rest have lymphadenopathy (swollen glands), a rash, and low-grade fever that typically lasts for three days. If rubella is so mild, then why do we need a rubella vaccine? The main reason is that up to 80% of babies who are born to mothers who have rubella during their first trimester of pregnancy often develop congenital rubella syndrome, with an increased risk of miscarriage. These babies are usually born with many birth defects, including cataracts, deafness, glaucoma, heart defects, hepatitis, low birth weight, mental retardation, microcephaly (a small head), and thrombocytopenic purpura (low platelet counts in their blood). During a rubella outbreak in 1964 to 1965, there were about 20,000 cases of congenital rubella syndrome. Rubella is now rare in the United States since the introduction of the rubella vaccine in 1969 (it is a part of the MMR vaccine), but is still a problem in the rest of the world, with over 250,000 cases in 2006. Most parents associate tetanus with "lockjaw" and needing a tetanus shot if you step on a rusty nail. Infection in newborns (neonatal tetanus with an infected umbilical stump) used to be the most common type of tetanus infections and was quite serious, as up to 95% of the babies died. These infections were already on the decline when the tetanus vaccine was introduced in 1938 though, because of improved delivery conditions and hygiene. Tetanus is caused by toxins produced by the Clostridium tetani bacteria. Spores of the C. tetani bacteria are commonly found in soil and in the intestines of many animals. The spores can easily contaminate cuts, scrapes, and other wounds -- especially dirty wounds. Unlike all other vaccine-preventable illnesses, tetanus is not contagious. Good hygiene and continued vaccination with the tetanus vaccine (the T in the DTaP and Tdap vaccines) have lead to low levels of tetanus in the United States. It is still a big problem around the world though. In addition to the 10 major infections that have been conquered or well controlled in the United States by vaccines, health experts are still working on eliminating others with new vaccines. These include viruses and bacteria that either change or include multiple strains and so current vaccines help, but haven't eliminated the diseases entirely. 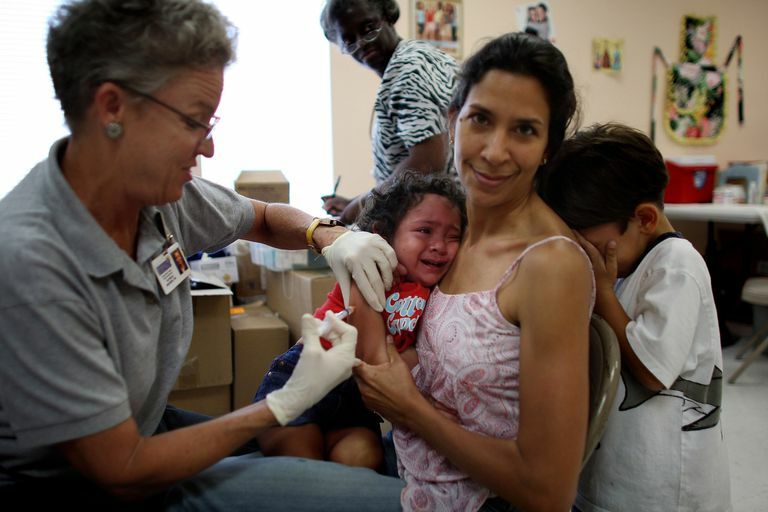 This includes the flu vaccine, which must be given each year, the pneumococcal, meningococcal, and rotavirus vaccines, which only target certain strains of bacteria and viruses, and the chicken pox, hepatitis B, and hepatitis A vaccines, which haven't been given to enough people to eliminate these infections. Flu – even though a yearly flu vaccine is recommended for all children who are at least six months old, there continue to be about 44 to 67 flu deaths among children the last few years, mostly among unvaccinated children. Rotavirus – worldwide, there are about 450,000 to 600,000 deaths in children each year from rotavirus, a common cause of diarrhea. In the United States, rotavirus causes about 3 million cases of diarrhea, which leads to about 80,000 hospitalizations, and 20 to 40 deaths, although this is greatly decreasing now that we have two rotavirus vaccines - RotaTeq and Rotarix. Chickenpox – although many parents think chickenpox is a mild infection, before the routine use of Varivax, the chickenpox vaccine in 1995, there were about 4 million cases of chickenpox each year, with an average of 10,500 hospitalizations and 100 deaths each year. Hepatitis B – about 400 million in the world are chronically infected with the hepatitis B virus, including over 1 million people in the United States. Children can get hepatitis B from blood and body fluids and if they are born to a mother who has hepatitis B, which is why it is important that they get their first hepatitis B vaccine as soon as possible after they are born. This plan of universal infant vaccination has greatly reduced the cases of childhood hepatitis B infections. Since some children get hepatitis B without any risk factors, a birth dose of the hepatitis B vaccine is important, even if a mother doesn't have hepatitis B. Hepatitis A – unlike hepatitis B, children usually get hepatitis A from daycare and from eating contaminated food, including seafood, fresh produce, and from outbreaks in restaurants. Most children in developing countries end up getting infected with the hepatitis A virus, and although usually not fatal, it is one of the most common vaccine-preventable illnesses in the United States too. Pneumococcus – the pneumococcus bacteria or Streptococcus pneumoniae can cause meningitis, pneumonia, bacteremia, and ear infections. Two pneumococcal vaccines, including Prevnar that is given as part of the routine childhood immunization schedule, and Pneumovax, which is given to older high-risk children and adults, is helping to decrease these infections. Before the vaccines were available, S. pneumoniae would cause about 700 cases of bacterial meningitis and 200 deaths each year in children. Worldwide, it is thought to cause about 1.9 million deaths each year in children under age 2. Meningococcus – the meningococcus bacteria or Neisseria meningitides leads to over 50,000 deaths each year around the world. In the United States, there are about 2,000 to 3,500 cases each year, and about 10% of affected children die. The Menactra and Menveo meningococcal vaccines are recommended for all children when they are 11 to 12 years old. And unfortunately, there are many childhood killer infections for which there are no vaccines yet, like malaria (over 850,000 deaths each year), tuberculosis (450,000 deaths each year), and HIV/AIDS (over 320,000 deaths each year). Mandell, Bennett, & Dolin: Principles and Practice of Infectious Diseases, 6th ed. Long: Principles and Practice of Pediatric Infectious Diseases, 2nd ed. CDC. Vaccine Preventable Deaths and the Global Immunization Vision and Strategy, 2006--2015. MMWR. May 12, 2006. CDC. Diphtheria in the Former Soviet Union: Reemergence of a Pandemic Disease. Emerging Infectious Diseases. December 1998. Measles outbreak in Dublin, 2000. McBrien J - Pediatr Infect Dis J - 01-JUL-2003; 22(7): 580-4. Vaccine preventable diseases: current perspectives in historical context, Part I. Weisberg SS - Dis Mon - 01-SEP-2007; 53(9): 422-66.